Bacon, glazed with a spicy brown sugar seasoning and baked. Pig Candy! When I first posted Pig Candy in the early stages of my original blog, nobody seemed to know anything about it. 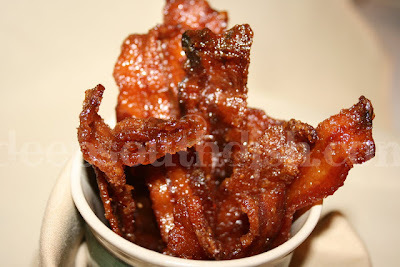 Now Candied Bacon, Brown Sugar Bacon, or as Ms. Jill Conner Browne, Head Queen of THE Sweet Potato Queens calls it, Pig Candy, seems to be all over the place, with a wide range of variations. She's from Mississippi, ya know. Now, me, I never need an excuse to eat bacon. I could go the rest of my life without a lot of foods, but don't take away my bacon! But still, who thought to put brown sugar and bacon together? You know those "times" where you just gotta have salty-sweet? Just Genius. To kick it up a bit, I throw in some chili powder, spicy Colman's mustard and a bit of Slap Ya Mama Cajun seasoning in with that brown sugar. If you want a little extra bite, mince some pickled jalapenos and add those to the top. Talk about some good! To make it kinda all holiday-style you could even throw in a bit of pecan, or dip one end of each cooked and cooled piece in some chocolate. Now we're talkin'! As Ms. Jill says, you just might think you're about to ascend directly into heaven. Use candied bacon on sandwiches and burgers, or crumble and use as a garnish on top of salads, soups or deviled eggs, or in baked goodies such as cupcakes, muffins and brownies. Preheat oven to 350 degrees F. For easy cleanup, line a jelly roll pan with aluminum foil. Place an oven safe rack on top and spray liberally with non-stick spray; set aside. Place the brown sugar, dry mustard, chili powder and Cajun seasoning in a Ziploc bag, seal and shake until well mixed. Toss bacon in the mixture a few strips at a time and lay the coated bacon strips on the rack. If using pecans, shake them up in the remaining brown sugar mixture after you've coated all the bacon, and then sprinkle them on top of the bacon. Sprinkle any remaining brown sugar mixture on top of each piece of bacon. Bake at 350 degrees F for about 30 to 45 minutes, or longer, until cooked through. Let the bacon cool on the rack, or use tongs to transfer to a sheet of parchment paper in a single layer. Eat as is for a snack or with a meal, use on sandwiches, crumble over a salad or on top of homemade vanilla ice cream. Cook's Notes: For easier clean up, don't skip the step of lining the baking sheet with aluminum foil. Dark brown sugar is heavier in molasses so keep an eye on it so that it doesn't overcook and burn. I like Wright brand bacon for this recipe and it comes in several varieties, from hickory smoked, applewood, peppered, maple and even yes, brown sugar! To Make Ahead: Store in the refrigerator in an oblong sealed container, in layers, with wax paper or parchment in between for 3 to 4 days. May also be frozen. Bacon will soften with refrigeration. Bourbon and Cane Syrup Candied Bacon: Combine brown sugar and seasonings in a small bowl. Place bacon strips on rack and brush with a mixture of 1/4 cup each bourbon and cane syrup. May also use maple syrup. Sprinkle with brown sugar mixture, press in, turn and repeat. Other Variations: Let the bacon cool. Melt some chocolate and dip one end of the finished bacon into the melted chocolate. You may also brush the raw bacon strips with a bit of prepared yellow or spicy mustard mixed with Worcestershire sauce, instead of using the dry mustard, then dredge the bacon pieces in the brown sugar mixture and bake as above. For extra spice, include about 1/4 teaspoon of cinnamon. For heat, substitute finely minced pickled jalapenos for the pecans, or sprinkle with dried red pepper flakes. Tip: Crumble candied bacon and use as a garnish on top of salads, soups or deviled eggs, on burgers and sandwiches, in baked goodies such as cupcakes, muffins and brownies. bacon is now on my shopping list for the week!! and I'm the same way, take away any other meat, but leave me my bacon! Oh my gosh, I haven't had bacon like this in years. This was one of my grandpa's favorite ways for grandma to fix his bacon. She also fixed him fresh side pork. Do you ever have that? I fix fresh side a lot but the sweet bacon I hadn't thought about in years. Maybe it was just a calorie block?? Bacon is a life support substance. Can't live without it. I love the new look of your blog. How do you do it? You are always addin' somethin' new. It looks great. See what I mean ya'll?? Every since I read that sugar dogs post, I been thinkin' sweet BACON!!! I just had to have some LOL! Oh Rebel the backgrounds at that site are so easy cuz you add them in as html code using the add a gadget thingy under customize instead of having to manipulate and change the html code. I'm always afraid of losing everything that other way, but her's are easy and she has a lot of freebie ones. Click on that link in the very upper left hand side of the page and go have a look see. Where it says free backgrounds "cutest blog on the block" I swear it's easy as just adding any old gadget - check it out! Thanks for visiting my blog in December. I thought I'd stop by and visit yours, and look what I'm greeted with! YUM!!! Brown sugared bacon! Excuse me while I take a moment to hug my computer screen! This sounds fabulous. Bacon. With brown sugar. Be still my heart! Happy New Year! Hot Dang that looks so good. I have got to make this as a addition to one of my breakfasts. I love my bacon as well. Hey Diana!! Bacon, oh yeah! I'm in love. I don't like to fry bacon - cuz I'm a wuss when it comes to oil pops and splatters - but I love to eat it. And I often dip it in syrup but this seems to be, well on a totally different level. Bacon is going on the shopping list now! When we have pancakes and bacon for breakfast, I always dip my crispy bacon in real maple syrup. My husband says it looks disgusting, as does my daughter, but I bet it tastes a lil bit like brown sugar bacon. I'm going to have to try this .. and thankfully, won't have to share w/ the rest of the family LOL. Sarah, try doing a full tray of bacon in the oven. It works fantastic. I used to do that when I was low carbing. Jessica, I do the same thing!! I LOVE that. The brown sugar is a little bit different because it sort of caramelizes the bacon, but both are good. Double D...Tried this and was really impressed. Usually I manage to ruin a reciepe on the first try but this was so easy. There is only one drawback to Pig Candy and that is the fact that I am able to eat them a lot faster than I can make them! SOOOOO Good. lol, Wouldn't be more like "Candied Pig" instead :D I've got to do this at out next outing. Do you know how long this can be stored for? And the best way to do it? Hi Brad! You can adjust the recipe if you don't want to make this much, but if you're talking about making it ahead, I would store it in an oblong sealed container, in layers, with wax paper or parchment in between, in the refrigerator, not on the counter. It's going to soften with refrigeration but it will still be great! I'd say that 3 to 4 days would be best, although it could also be frozen. Hope that helps! I saw this recipe in your cookbook and HAD to give it a try. Oh my, this is sinfully good and adictive. There is a question above in the comments about storing pig candy. My problem was making enough that a few pieces were left for the table.